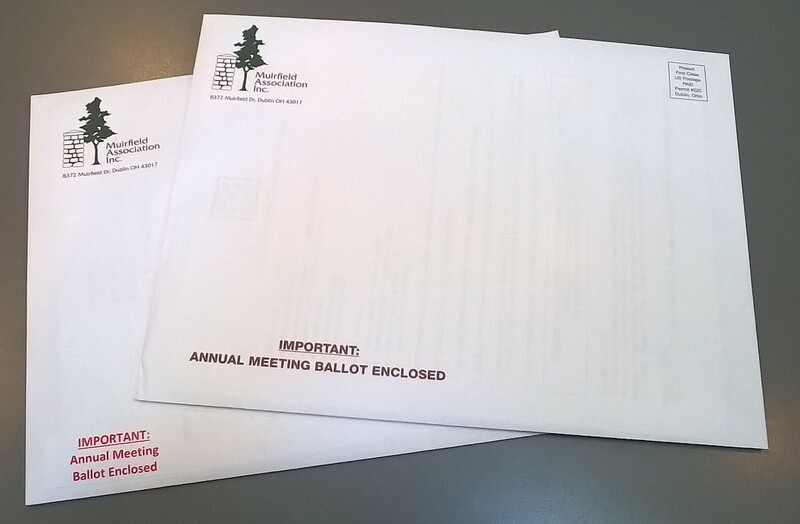 Annual Meeting Materials, including ballots, are being mailed today. Annual meeting materials are also online in the Members Area. The annual meeting will be Wednesday, April 25, 2018, 7:00 p.m., at The Country Club at Muirfield Village. Why didn’t I receive a ballot and proxy? We’ve made some changes this year, so please read through this carefully. If you have problems, questions or concerns, please contact us as soon as possible. There are two issues to vote on. One vote will be to elect three members to the Board of Directors. A second vote will be to add nine amendments to the Code of Regulations (the By-Laws) via proxy. If you plan to attend the annual meeting, there is no need to vote on the amendments to the Code of Regulations ahead of time since you will be able to vote in person at the meeting. Paper ballots to elect the Board of Directors are being counted by a third party, so they should be mailed in the envelope provided or brought sealed to the annual meeting. Ballots should not be mailed or brought to the Association office. However, limited proxy forms to amend the Code of Regulations should be returned to the Association office. Households on electronic communications will receive two separate emails; one ballot and one limited proxy. We must send these emails separately because voting for board members must be anonymous but voting for the amendments can’t be. Please keep reading so you know what to watch for and how to vote if you’re on paper communications or if you’ve opted in to receive electronic ballots. Important: the Board of Directors ballot is tri-folder. The ballot and return envelopes may have settled to the bottom of the mailing envelope or could have become lodged between other pages in the packet, so please check the entire mailing envelope and its contents carefully. The limited proxy, cover letter, Language to Amend the Code of Regulations of Muirfield Association, Inc. and all other materials are not folded. Place the BALLOT envelope inside the return envelope. Sign where indicated on the envelope, stamp it and mail it. Mail this to the address on the front of the return envelope; do not mail or bring to the Association office. Alternately, sealed ballots may be brought to the annual meeting. Included in the annual meeting packet will be a cover letter explaining the proposed amendments to the Code of Regulations, the actual text of the amendments, and a limited proxy. These proposed amendments will be introduced and a vote will be held at the Annual Meeting. The Code of Regulations requires approval from a majority of the members in attendance to pass the amendments. If you attend the meeting, a consent ballot will be given to you at the meeting, which means there is no need to complete the limited proxy. If you will not be able to attend the Annual Meeting and wish to vote for the amendments by proxy, complete, date, sign, and return the proxy to the Muirfield Association office at any time before 4:00 p.m. on April 25, 2018. Do not mail the limited proxy with the ballot for the Board of Directors. To save paper and resources, some materials are not included in the mailed annual meeting packet, including the swim and tennis schedules, the 2017 audited financial statement, and the 2017 annual meeting minutes. The financial statement and minutes are available in the Members Area. Upon request, the office will mail printed copies to anyone who is not able to access them electronically. Pool guest pass distribution is discussed below. For those residents on electronic communications, the ballot and proxy are being emailed today. Watch your email (including spam and trash) for two separate emails. They will both come from an address similar to "[email protected] via surveymonkey.com", but will have different titles. Please do not assume you’ve received two of the same email and accidentally delete one. Two emails are being sent because voting to elect board members must be done anonymously but a resident must identify themselves to vote for the amendments. One email will link you to the ballot to vote for Board of Directors candidates. The email title will be "Voting Ballot from Muirfield Association”. This vote is anonymous. Although the office can see that you voted, they cannot see who you voted for. Board of Directors candidate biographies can be found online. Review them before starting the voting process. Since each household may only vote one time, only ONE EMAIL will be sent to the PRIMARY email address you provided for your household. Watch your spam carefully! The email will contain directions and a link to your ballot. This link will only work one time, so please confer with other members of your household before voting. Once the ballot is cast, it cannot be changed. To prevent the possibility of duplicate voting, you cannot be issued a paper ballot once an electronic ballot is sent (and vise versa). Electronic voting will close automatically at 4 p.m. on Wednesday, April 25. You must vote by that time. A second email will link you to a limited proxy form which will allow you to vote in favor or against each of the proposed amendments to the Code of Regulations. The title will be "Ballot to Amend the Code of Regulations for Muirfield Association”. The email will contain directions and a link to the proxy. This is not an anonymous process, so you must supply your name and lot or Muirfield street address. A household can only vote once, so please confer with other members of your household before voting. If you do not receive one or both emails by April 15, check your spam and deleted items. If you are not able to locate one or both, please email [email protected] and provide your name, Muirfield street address and whether you’re missing the ballot, proxy or both. All annual meeting materials, other than ballots, may be found online in the Members Area. Register here if you don’t have a Members Area account yet or click here if you’ve forgotten your password. First, if you received your packet in mail, check the envelope carefully! The ballot is tri-folded and may have settled to the bottom or gotten stuck between other papers. If your ballot and proxy are still not there, it could be that your household's account is delinquent, your payment did not reach us by the time annual meeting materials were sent, your property has outstanding deed violation(s) or you never registered your household with the office. It's also possible that your postal mail has not arrived (if being forwarded) or the ballot and/or proxy emails have been sent to spam or bounced. If you did not receive a ballot or proxy and do not know why, we want to help you! Please contact us at 614-889-0922 or [email protected]. We will investigate the situation and make every attempt to resolve it. Staff is happy to assist you, but please contact us in a timely manner so there is adequate time to investigate the problem. To prevent pool guest passes from being lost in the mail, they will not be mailed this year, but they are very easy to get! An adult member of your household may pick up 15 guest passes each year from either the Association office any time or from one of the pools during pool season. A Muirfield photo ID is required to pick up passes at the pool. Residents may only pick up passes for their own household and only an adult member may pick up passes. Children, nannies, guests and others cannot. The resident picking up passes must sign for them. All transactions will be recorded. Remember, guest passes never expire, even if they have a previous year printed on them. Guests must always be accompanied by a resident when using the pools.